1 of 2 Heat oven to 450 degrees . On floured surface, roll dough to a 16-inch circle. Transfer to a greased round pizza pan. Whisk ketchup with mustard and spread over crust. Top with meat and cheese. 2 of 2 Bake on lowest oven rack for 18 to 22 minutes, until crust is brown and cheese is melted. Meanwhile, toss arugula with vinegar. 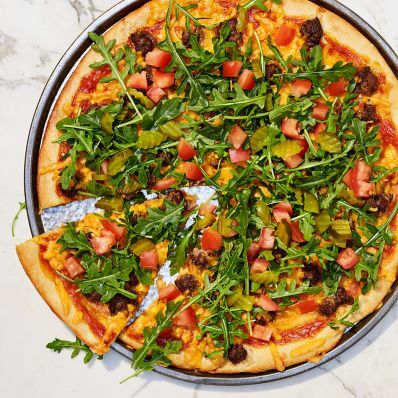 Remove pizza from oven and top with chopped pickles, arugula and diced tomato. Per Serving: 9 g sat. fat, 21 g Fat, total, 42 g carb., 452 kcal cal., 8 g sugar, 0 g fiber, 810 mg sodium, 25 g pro.